In Issue 56 (page 96), Scott Dalgleish discussed his results with Dynomite Diesel Performance (DDP) injectors on his Third Generation Turbo Diesel. In his quest for mileage first, and power second, Scott chose a set of Stage 1 fuel injectors. His article described the aforementioned extrude honing manufacturing processes and provided dyno results verifying the horsepower claims of DDP. He reported an increase in fuel mileage of 8%, not accounting for the approximately 7% loss he associated with the winter fuel he was using at the time. This comes out to about 1.5-2.5mpg, estimating conservatively. In Issue 59, Scott went to Stage 2 injectors and reported a 6% loss in fuel economy with them (compared to the Stage 1s) in Issue 60, page 84. Doug Leno gave us additional discussion and photos in Issue 57, page 45. He also chose Stage 2 injectors. A couple of years ago, Bosch started supplying replacement HPCR injectors with Saleen coated steel bodies for better durability against cracking and some internal re-design to minimize sticking and erosion of the fuel return seat. This photo shows six new DDP Stage 1 injectors with shiny white coated steel bodies, and facing the other way is a used injector with the regular gray colored steel body. 72i11. Six new DDP Stage 1 injectors with the new Bosch shiny white coated steel bodies. 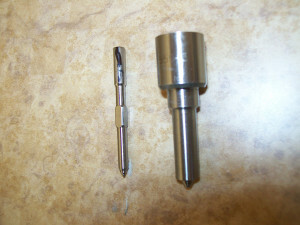 Facing the other way is a used injector with the regular gray colored steel body. I have seen various types of injector failures, particularly on HPCR Turbo Diesels with over 150,000 miles. As I mentioned before, they cycle two times per firing on 2003-2004 engines. They cycle three times per firing on 2004.5 through 2007 engines, and four times on the new 2007.5-up engine (6.7-liters). Fuel pressures are higher, so any tiny residual particulates are more abrasive than on earlier engines. It is not reasonable to expect them to last as long as 12-valve or 24-valve injectors. While “chatter” during the fuel pulse made mechanical injectors wear faster than you might think for one cycle per injection “event”, the springs were durable. In comparison, the HPCR’s electric solenoids are things with “minds of their own” and as you know, electrical stuff can fail at a moment’s notice. These solenoids, along with varnish on the pintles that causes sticking, have become significant sources of high-mileage failure on HPCR engines. The dirtier the fuel (3 micron filtration is the way to go, and FASS offers such a filter) and the higher the rail pressure, the faster the injectors wear out. Some folks who advocate using poorly filtered “additives” such as used engine oil will have problems. Injectors are more complex and clearances are tighter to work with higher injection pressures and meet ever stricter emissions regulations. Our usage habits have to be consistent with these changes. We could “get away with” some practices such as iffy fuel, high EGT, and “neighborhood/farm shop” modified injectors with the old engines. We need to use cleaner fuel (no used motor oil, please, on HPCR engines). If that engine oil was too used up and filled with wear metals for your engine bearings with .005” clearance, why should you add some to your fuel, and use it in a fuel injection system with 25 millionths of an inch clearances? You also will want to use better fuel filtration, moderate your EGTs, and keep fuel rail pressures closer to stock. The new engines will respond to modifications with more power than ever before, but to get the longevity and reliability you want, you have to practice moderation. 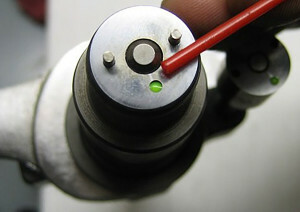 When a HPCR injector fails, it can be something that needs immediate attention. You don’t want a crankcase full of diesel fuel, a dead miss, or clouds of white smoke with the attendant washing of lubrication from the cylinder walls. 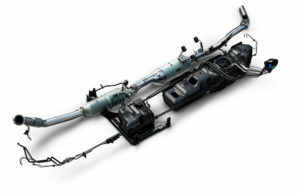 Cummins does offer a rail plug to deactivate one cylinder for test purposes. It is not suitable for extended use, such as getting home pulling your trailer. You ask, “Why not?” First, the injector that is capped off will fail completely within a few minutes due to lack of lubrication and cooling. Second, if one injector is bad, others are most likely going to follow suit. The vibration and harmonics will likely damage the balancer, clutch, transmission, and engine bearings. In a desperate situation, capping one cylinder of the rail for a brief time could be justified. 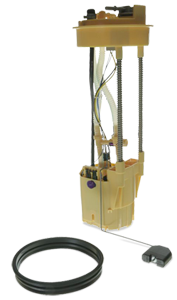 If the cause of the problem is a cracked injection line (usually #4 or #6), it would be much better to carry replacement lines and replace the line immediately. Again, DON’T add used engine oil, transmission fluid, and other junk to your fuel just because an old-time trucker said to do so! Stan Gozzi of Chrysler related to me how a fuel shop technician told him to paint the pintle of an injector with a Magic Marker and then try to replace the pintle into the nozzle. It won’t fit because the clearance is too tight. If you force the pintle (needle) into the nozzle, you will wipe off the Magic Marker! That more viscous “stuff” that you add to diesel fuel will cause problems. As I related in Issue 56 (page 103), particulates become more damaging/abrasive as fuel pressure increases, so the higher pressures and tighter fuel system clearances (to prevent excessive leakage of fuel between parts) make better filtration essential in the newer Turbo Diesels. 72i12. Pintle with Magic Marker stripe, showing inadequate clearance for the nozzle. Water in the fuel system remains a major source of problems. Here you can see a rusted but cleaned up injector connector tube above a good tube. Imagine how much rust can be found inside the rusted tube, rust that will be sent to the injector. 72i13. 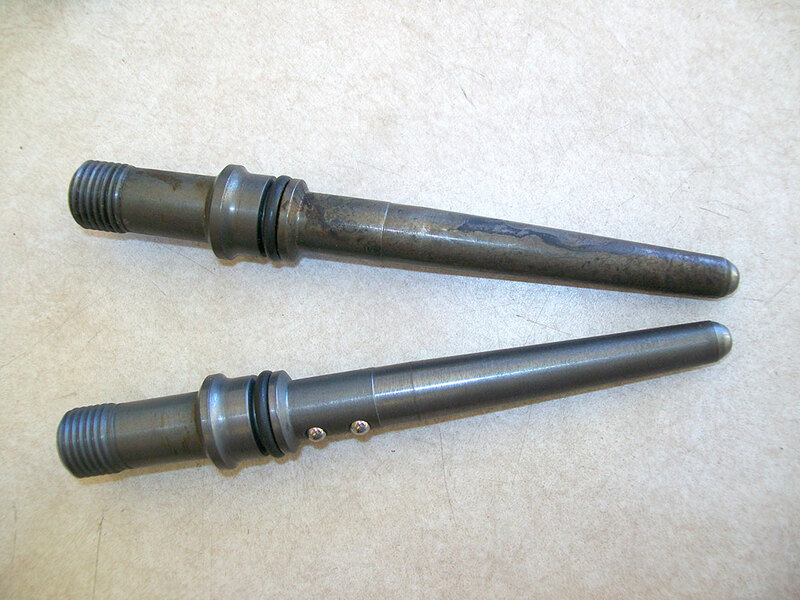 Rust pitted connector tube above a good tube. 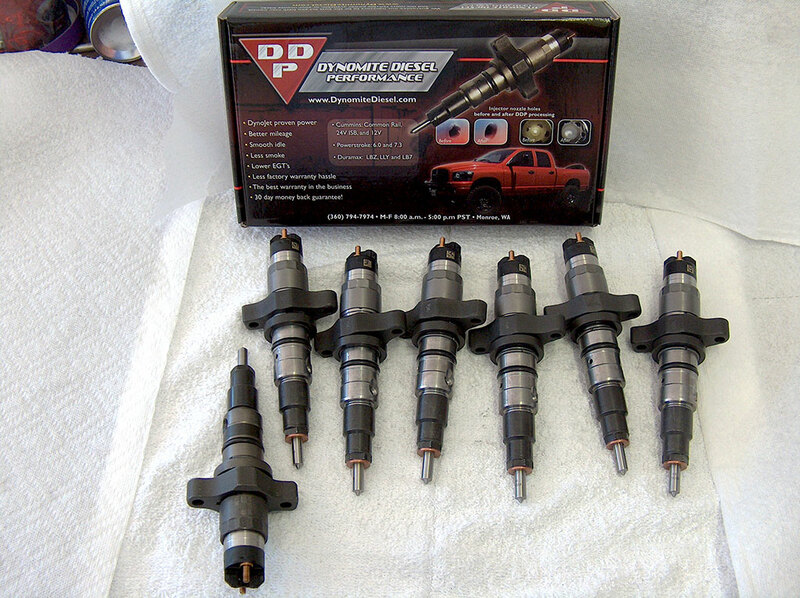 For preventive maintenance, I purchased a completely new set of injectors at about 100,000 miles. Like the two other TDR writers, Dalgleish and Leno, I asked Lenny Reed of DDP what would give the best mileage. He recommended his Stage 1 over anything else, including stock. In the future, since I use only high quality fuel and a 3 micron filter, and have not raised rail pressure nor run high EGT, I believe I can extend the safe service interval for my injectors significantly. Cost for parts (six injectors) will typically run around $2000 for rebuilt injectors, up to $2700-$3000 for new stock or Stage 1 units. Installation should take about eight hours. Sometimes injector problems will be reported by the engine’s ECM as diagnostic trouble codes, but often diagnosis is a matter of careful thinking. First replace potentially relevant, less expensive parts such as the FCA, pressure sensor on the fuel rail, and pressure relief valve. The nature of the problem you have should be considered against the roles these parts play. Hard starting could be caused by these parts, for example, or by excessive fuel return from worn and eroded check balls and seats in the injectors. White smoke at idle is most likely caused by cracked injectors or sticking pintles. Violent rattling at idle and difficulty in maintaining idle is most likely the FCA or possibly the pressure sensor. If you have been experimenting with fuels or additives, have stacked pressure and other fueling boxes, and/or have big power upgrades with the stock turbo, you are probably a candidate for new injectors. If you just don’t have very good luck, it might be injectors. Do yourself a big favor. 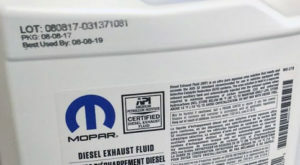 If you added ATF or some other “mouse milk” on the advice of that old-time trucker, completely drain and flush the entire fuel system, and replace all the filters before installing new injectors. If you like that big power, get enough turbocharger/s before using it with the new injectors. It is far easier to make big power with the HPCR engines than with earlier versions, but remember that you can add power/fuel and increase EGTs with no warning until it breaks or melts. The faithful Cummins will pull harder and harder upon your demand, even if it kills itself. Very high rail pressures (from pressure boxes mostly) and very high EGTs contribute greatly to cracking and wear of moving parts inside the injectors. 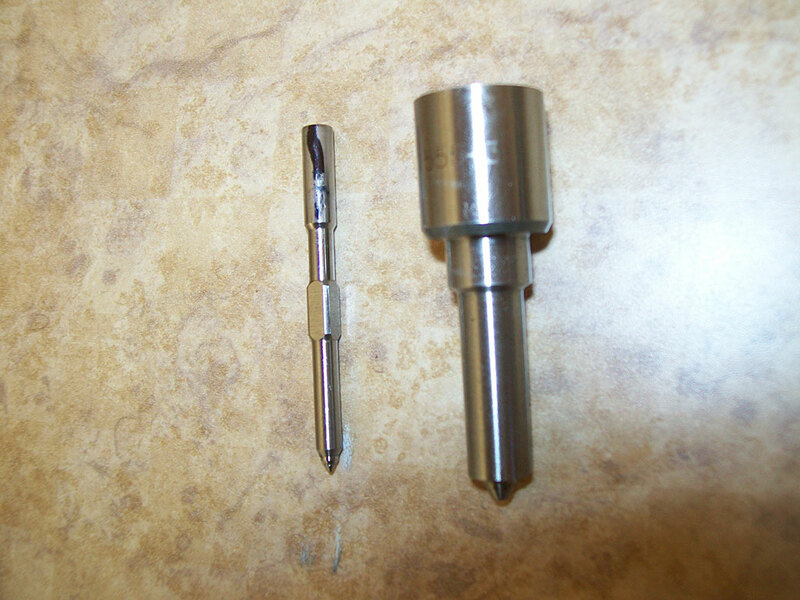 Only after the injector is disassembled can you see the cracked nozzle and cracked body. It is easy and relatively cheap to add electronic power-adders, without taking adequate steps to control EGTs. You are just a click away from taking the rail pressures so high that you will sooner or later “blow” the pressure relief valve on the fuel rail. If your truck is hard to start, that may be the reason. 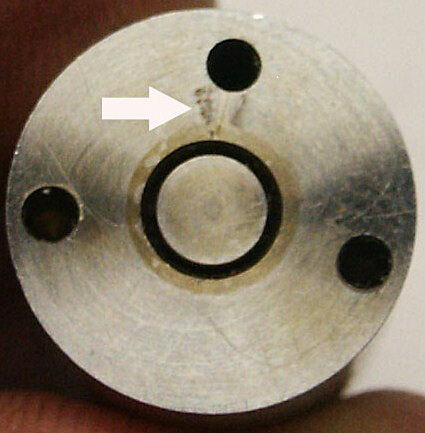 High rail pressures are also resulting in greatly increased injector failures. Any contamination in the fuel becomes much more abrasive at higher injection pressures, necessitating better fuel filtration. 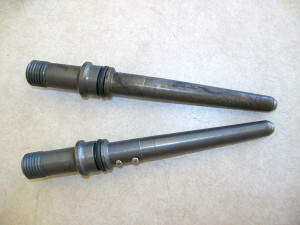 Think of a water hose, then a high pressure nozzle on the hose, then a water jet steel cutter. It’s all about pressure! I am running the FASS 200 lift pump system with 3 micron filtration, and use the stock filter canister with a 7 micron filter as “last chance” back-up. I have seen a lot of injectors with failures at the nozzles and the injector bodies from high rail pressures and high exhaust gas temperatures. In Part Three, we have a look at fuel injector upgrades and preventing failures. You’re right about how diesel injectors are complex. My friend drives truck and he’s a pretty good mechanic, but he wasn’t able to diagnose the problem he had with his fuel injector. He ended up going in to have a specialized mechanic look at it. I’ll show him this article. Thanks!